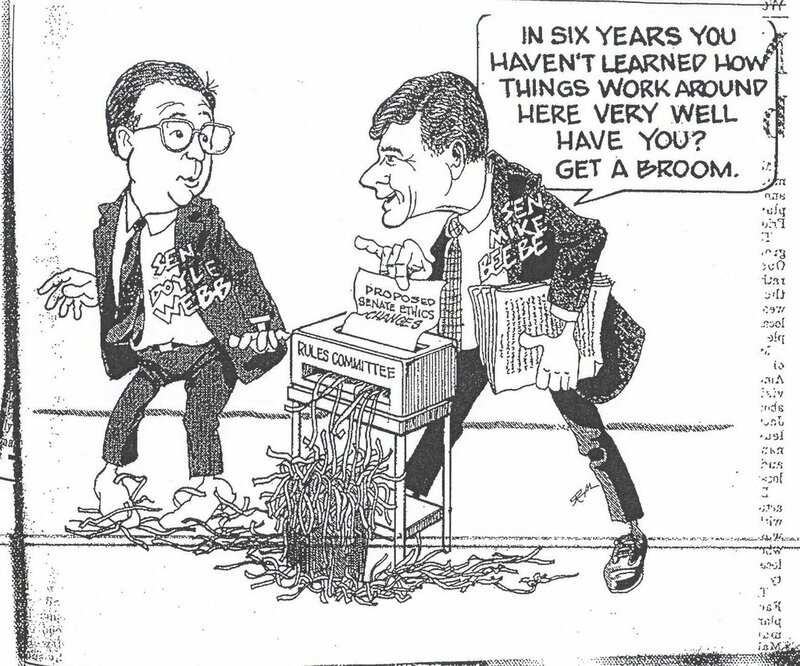 PRINCETON, NJ -- The plea deal announced Tuesday between Washington, D.C., lobbyist Jack Abramoff and federal prosecutors could be very bad news for the members of Congress whom Abramoff implicates. The long-range concerns are how Abramoff's testimony -- and subsequent actions taken by federal prosecutors -- will affect public opinion of Congress more generally, and the impact on the midterm congressional elections this fall. One scenario is that the revelations could be toxic for the Republican Party if most of the Congress members Abramoff says he bribed for political influence are members of the GOP, which has been the majority party in Congress since 1995. Alternatively, those fearing the bad publicity -- and those seeking to exploit it -- may find that the public shock value of lobbyist scandals has worn off. 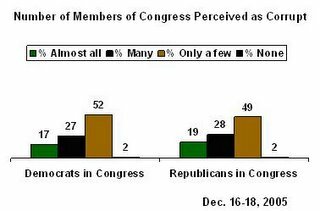 According to a recent CNN/USA Today/Gallup poll, Americans were already widely skeptical about the ethics of members of Congress before Abramoff's plea bargain. Nearly half (49%) of Americans surveyed in the Dec. 16-18 poll said they believe most members of Congress are corrupt, while 46% disagree. It's reasonable to assume that political corruption is fresh in Americans' minds given the indictment this fall of Republican House Majority Leader Tom DeLay on campaign finance-related charges and former California Republican Congressman Randy "Duke" Cunningham's admission that he took bribes. 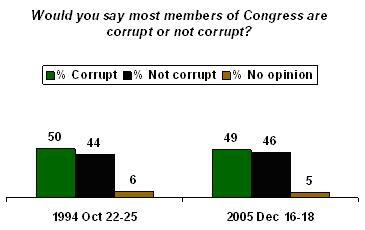 But recent public perceptions of the scope of corruption in Congress are no different from what Gallup found more than a decade ago. In 1994, the figures were nearly identical to today's, with 50% considering most members of Congress to be corrupt. Democratic characteristic. The latest poll finds virtually no difference in Americans' perceptions of the extent of corruption among the members of each party in Congress. Similar to the trend question about the scope of corruption, this measure finds Americans about evenly split between those saying many or all members of each party are corrupt (44% say this about Democrats and 47% about Republicans), and those saying only a few members are corrupt (52% for Democrats and 49% for Republicans). Almost no one thinks that no members of either party are corrupt (2%), meaning that it probably comes as no surprise to Americans that the occasional congress member is charged with wrongdoing. A more troubling sign for Congress comes from the 2005 trend in public approval of the job Congress is doing. At the same time that Americans were souring on DeLay, possibly because of his mounting ethical troubles, they grew increasingly critical of the job Congress was doing more generally -- although it's not clear how connected these two trends are. Gallup has conducted frequent measures of public opinion of DeLay since February 2005. As public recognition of the Republican leader has grown, so has the percentage holding an unfavorable opinion of him, while his favorable rating has slipped. In February 2005, 29% of Americans had a favorable opinion of DeLay, slightly more than the 24% viewing him unfavorably. Today, 49% of Americans have an unfavorable opinion of him while only 16% view him favorably. Of potential concern to members of Congress is the fact that the public's overall opinion of Congress has followed a similar trajectory during the past year. In February, about equal numbers of Americans approved as disapproved of the way Congress was handling its job. As of mid-October, Americans disapproved by more than a 2-to-1 margin (64% vs. 29%). This level of disapproval continued through early December, and represents the lowest support Gallup has recorded for Congress in nearly 10 years (since May 1996). 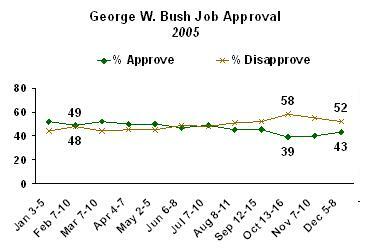 Importantly, the same trend is not seen in ratings of President George W. Bush. 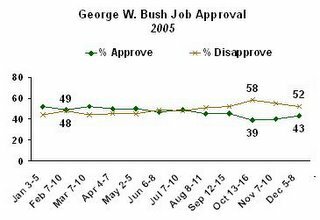 While public disapproval of Bush increased between February and October (from 48% to 58%), it partially recovered in December, and ratings of Bush today are only slightly lower than where they stood earlier last year. Thus, it does not appear that the decline in Congress approval is part of a larger pattern of public dissatisfaction with the leadership of the country. Whether it is mostly due to bad publicity from DeLay's problems, or from public reaction to other Congress actions like its involvement in the Terri Schiavo case last year, is not entirely clear. Perhaps even more significant to the Republican Party is the fact that the DeLay case did not shake overall public confidence in the way Republicans in Congress are doing their jobs. 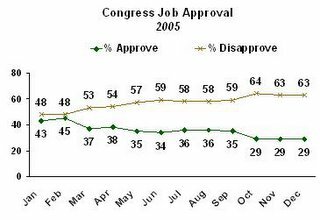 Between April and October 2005, the percentage approving of the Republicans in Congress fell only slightly, from 42% to 38%. During the same period there was a 1-percentage point increase, from 40% to 41%, in approval of congressional Democrats. The heart of the matter concerning the charges against Abramoff, DeLay, Traficant, Cunningham, and many others who have run afoul of campaign finance laws is that the money changing hands gives special interest groups undue influence in the halls of government. Americans have long believed that money and politics don't mix well. According to a 1997 Gallup survey, 53% of Americans said that campaign contributions influence the policies supported by elected officials "a great deal;" another 33% said these contributions influence policies a moderate amount. Furthermore, the same 1997 poll found three-quarters of Americans inclined to believe that elected officials in Washington are influenced more by the pressure they receive from major campaign contributors than they are by the best interests of the country (77% vs. 19%). And yet, Americans seem resigned to the problem. An October 2000 survey found only 28% of Americans optimistic that major legislative changes could succeed in reducing the power of special interests in Washington; nearly two-thirds (64%) said special interests will always find a way to maintain their power in Washington. Still, Americans are not willing to dismiss the importance of corruption. Only 12% of registered voters in the Dec. 16-18 poll say the corruption issue will not be important to their vote for Congress in 2006. The majority say it will be very important, including 11% who say it will be "the most important issue" and 44% saying it will be "very important." Thirty-two percent say it will be moderately important. Despite the partisan furor about the DeLay and Abramoff scandals, there is no difference between Republicans and Democrats at large in their perception of corruption as a campaign issue. Only a small fraction of both groups (10% of Republicans and 14% of Democrats), say that corruption will be the most important issue for them this fall. An additional 43% of Republicans and 45% of Democrats say it will be very important. These results are based on telephone interviews with a randomly selected national sample of 1,003 adults, aged 18 and older, conducted Dec. 16-18, 2005. For results based on this sample, one can say with 95% confidence that the maximum error attributable to sampling and other random effects is ±3 percentage points. In addition to sampling error, question wording and practical difficulties in conducting surveys can introduce error or bias into the findings of public opinion polls. 7. I'd like to ask you about most members of Congress. Would you say that most members of Congress are corrupt or not corrupt? 8. How many -- [ITEMS ROTATED] -- do you think are corrupt -- almost all, many, only a few, or none? 9. 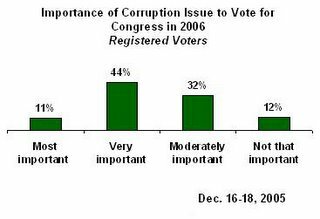 How important will the issue of corruption be to your vote for Congress next year -- will it be -- the most important issue, very important, but not the most important issue, moderately important, or not that important? You can chart and graph this for a year, but it will still come out as a republican power abuse problem. They took the most and they abused the system the most. After all those years in the wilderness, I guess they thought it was just their turn. Usual Washington story, it ain't bad till you're caught. Is Win back in the race? Did Anyone Else See This On Beebe's Website? "Everything I Thought I Knew Was Wrong"